We welcome walkers! We require that walkers be properly prepared and trained to finish the Halfathon within 4 hours (18 minute/mile pace). Please note that 4 hours after the start, course support ((i.e. aid/water stations, volunteers, course marshals, clocks, etc.) is not guaranteed. Due to our staging of this race entirely within a park and primarily on nature trails, we will NOT be offering an early walker’s start. All athletes will start at the same time in their respective races. All walker-finishers will be rewarded with the Halloween edition of our unique “running starfish” gold medal. All walkers will be eligible for our special Halloween Costume awards, regardless of finishing time. 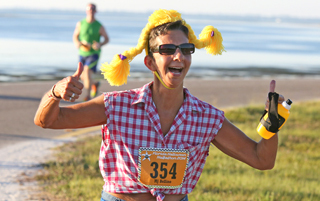 Fitness Walkers are also eligible to be recognized as Florida Halfathon Challenge finishers.